Bed canopies are such an overlooked piece of decor for adding that 5 star feel to your bedroom, guest room or kids’ rooms. We’ve put together some fresh ideas and recommended the fabrics you can use to recreate the look. We simply can’t express how much we love this idea for a bed canopy. For starters, it can be recreated in any bedroom, no four poster bed required. The ceiling -mounted track means it can be added to absolutely any bed. Secondly, the double layer means a dark cosy interior experience, whilst still maintaining a soft, light exterior. This is the epitome of a modern canopy at it’s best. Use combinations of wide-width sheers from the Light Years collection to recreate this look. If you’re a staunch minimalist, this look may appeal to you. Two very subtle drops are seamlessly incorporated into this modern four-poster solution. This slick solution creates coziness in even the most unexpected space. 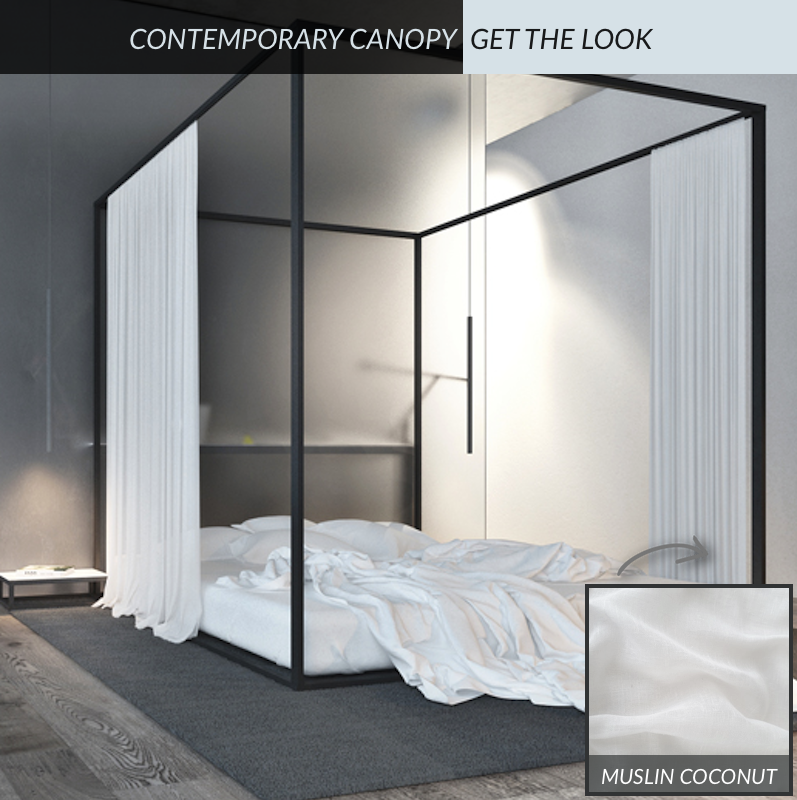 If the thought of sleeping cocooned up in a canopy makes you feel claustrophobic, a simple, sheer voile canopy that slips over the top of the bed is an alternative option that’s light, airy and still adds a touch of luxe to the boudoir. Our Light Years collection of wide width sheers offers multiple options for creating a modern bed canopy, across the colourways.